There are several ways that an index can be added to one's sidebar. Many Blogger blogs already have their labels listed in the sidebar. Wordpress blogs have categories. On your dashboard go to "layout"
In the sidebar "add a gadget"
Drag the widget to wherever you want it in the sidebar. Another option is to create your own tag list (index) with Blogger's links widget. The absolutely simplest way to allow folks to access your Delicious tags, is to create one link in your sidebar, directly to your Delicious bookmark page. "New Site Name" can be "Delicious.com" or "My Blog Index"
On the layout page you can drag the gadget anywhere you want in the sidebar. You can use this same feature to create a list of individual Delicious tag pages. If you have a lot of subcategories, you may wish to create individual link lists for broader categories. 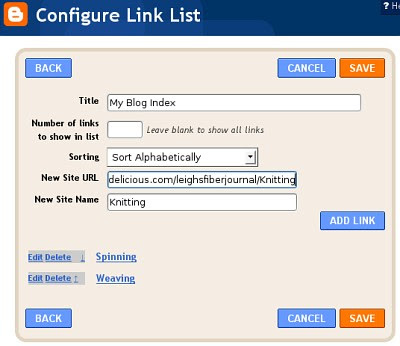 For example create a link list entitled "Knitting Index" and use all your Delicious knitting tags for "new site URL" and "new site title." This will create a knitting index. You will need to add each tag URL and its title to the generator. You can then add the code they generate to put into your side bar, using the "add html" widget (as explained above). Just be sure to make a back-up copy of your template before touching it! I hope this isn't too confusing. If you have any questions, comments, observations, or other ideas, please let me know! Thank you! I can definitely do this. Thanks Leigh. I'm working on it. Thank heavens I haven't been blogging to long.